STEELERS GREATEST GAMES..VOTE NOW: via steelers.com | "IT'S A STEELERS WORLD"! Steelers’ fans can do their part to make sure the Steelers advance in the NFL.com Bracketology. For the fourth straight year Steelers fans can fill out their brackets, football style. 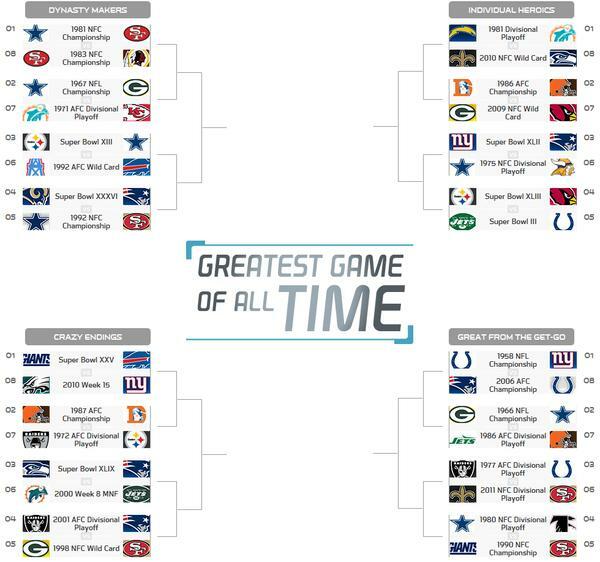 NFL.com Bracketology is in full effect, with fans voting on the greatest games of all-time this year. The Steelers are well represented in the ‘tournament,’ with three games included. Fans can vote for the Steelers to advance in three different categories. In the Individual Heroics bracket, the Steelers are the fourth seed for the victory over the Arizona Cardinals, and the heroics from James Harrison and Santonio Holmes are easy to remember. Click on the “VOTES” to vote now to make sure the games advance to the next round, or vote at NFL.com Bracketology.